You are my savior! Thank you a lot! Maybe this tutorial is quite old, but methods are still useful, and now i have an idea how to finish UV without starting over again (anything but 58th try ). Keep trying my friend, i also struggle with UVW mapping. For UV mapping, I'd suggest to do your smoothing groups first, create your smoothing groups where there is a hard edge, and you can unwrap based on smoothing groups. It helps speed things up, also make sure your uv islands are as straight as possible. Although not as important as you're not baking this from a high res mesh, but it will make texturing it easier when trying to do some scratches, etc. Take a gander at this tutorial. I finnaly start making some progress with UV map. Last edited by Hans_Rudel; 2018-12-03 at 11:11..
That is a pretty good unwrap. 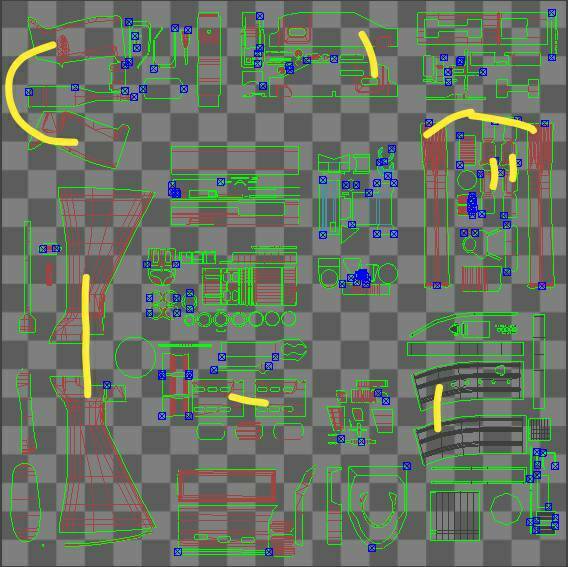 Now you just need to optimize the layout of the individual UV Chunks so that you will get the best possible texture quality. Right now your UV map has a lot of unused space. Scale all the chunks up a bit and start rearranging them so you will use the available space better. It is an annoying job now, but it will make your model look much better later on. Other then that you should consider giving the aperture sight more space on the UV map. Since you will be looking at that thing a lot and it is right in a players face. Similarly consider giving less vissible parts of your rifle less space. Yeah also don't forget symmetric parts can be overlayed . Saves you a lot of space. And i still have no idea how it will look in future. [MENTION=59494]Mineral[/MENTION], thank you for your advice about overlaying the symmetrical parts. I combined parts that will have the same texture (stock and lower reciever halfs have difference, so i kept them separated). You could start texturing the rifle at this point, but it would be better to check for issues before putting a lot of effort into a texture. Because even though you could always fix your uv map later when you run into trouble while texturing it is much better to do it now.